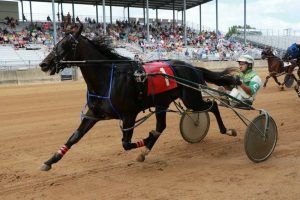 Fresh off his second place finish in the Classic Pace on Monday, King Lil Joe and driver Jay Cross returned to the track Tuesday, July 24 for the second time at the Elkhart County Fair and won the three-year-old colt and gelding pace. The He’s All That colt has been tough all season and just proved how tough he can be with back to back days of action. Starting from the inside post one, King Lil Joe went straight to the lead and never looked back, pacing home in :29.4 for the win, his 10th in 19 starts this year for Turrondus Smith of Canton, Mississippi and trainer Andrew Anderson. Always Chaos and Chad Clark finished second two and one-half lengths back over Downwyn Shark and Bradley Ferguson for third. The time of the mile was 2:00.0. The feature of the day was the Maple City Trot with two divisions each of the fillies and colts and geldings. Striking Encore and Doug Rideout won the first division for fillies in a time of 2:02.3 followed by Pinecraft Nellie and Matt Rheinheimer, winners of the second division of the fillies in a time of 2:02.2. In the three-year-old colts and geldings division of the Maple City Trot, Mr Quaker and Walter Haynes Jr. won the first division in 2:01.3 followed by a win from Uncle Leo and Doug Rideout in a time of 2:01.3. Rideout completed a driving and training double on the second portion of the racing program at the Elkhart County Fair. A total of 31 races were held during the two-day program that was combined due to a rainout on Saturday, July 21. Earlier in the day, driver Mike Peterson had a double along with the combination of driver Alex Udell and trainer Jack Myers, who also scored doubles on the earlier card. Greg Keim of the Goshen News, covered the racing programs at the Elkhart County Fair with Stacey Diamond providing photo coverage of the event.